A rendering of the proposed casino in East Windsor. A federal appeals court Wednesday ruled against MGM Resorts International, the owner of a casino under construction in Springfield, in the first round of what is expected to be a protracted legal fight to stop Connecticut from allowing a competing casino in East Windsor. The decision by the U.S. Court of Appeals for the 2nd Circuit upholds a judge’s dismissal of a lawsuit MGM filed in 2015 after the General Assembly passed a special act formalizing a process for the Mashantucket Pequot and Mohegan tribal nations to seek a town willing to host a casino. The court accepted Connecticut’s argument that the special act did not bar MGM or anyone else interested in developing a casino from negotiating with municipalities over a potential site, since the 2015 law did not grant the tribes the right to actually build anything. That required passage of a second law. MGM, the court concluded, had no standing to sue over the 2015 law. In fact, the court noted, MGM’s exclusivity agreement in Massachusetts bars it from developing a casino within 50 miles of Springfield, placing most of Connecticut off limits. “Because MGM has failed to allege any specific plans to develop a casino in Connecticut, we conclude that any competitive harms imposed by the Act are too speculative to support Article III standing,” the court said. The bigger question now is whether MGM has legal standing to sue since the Connecticut General Assembly took the second and more decisive step on June 7 of passing a bill granting the tribes the right to jointly develop a casino in East Windsor. The bill awaits Gov. Dannel P. Malloy’s signature. East Windsor, a community of about 12,000 people between Hartford and Springfield, already has granted local approval for MMCT, a partnership of the state’s two federally recognized tribes, to build a casino just off I-91 on the site of a long-vacant movie multiplex. In issuing its decision, a three-judge panel of the appellate court chose to ignore the legislative fight waged over what would be Connecticut’s first casino off tribal lands since it heard arguments in the appeal on Nov. 28, 2016. “Our conclusion does not rule out the possibility that MGM’s alleged harm may at some future point become sufficiently imminent. That possibility, though, is at this time only hypothetical and we therefore need not address it,” the court said. In addition to trying to dissuade Connecticut from approving the East Windsor casino, MGM lobbied the legislature to open lower Fairfield County to competition for a casino resort that could draw from the New York City market. Malloy opposed a broader expansion bill as a violation of the state’s longstanding exclusivity agreement with the tribes. 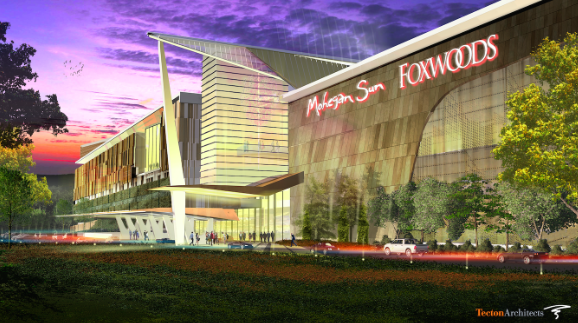 The tribes, the owners of Foxwoods Resort and Mohegan Sun in eastern Connecticut, said the East Windsor casino would blunt the loss of market share to Massachusetts, saving jobs and a revenue stream they share with the state. In return for exclusive rights to gaming, the tribes annually pay Connecticut 25 percent of their gross slots revenues — most recently worth about $266 million. In lobbying against the authorization bill this year, MGM argued that the legislature cannot exclusively deal with the tribes without violating the Equal Protection and Commerce clauses of the U.S. Constitution. Attorney General George Jepsen warned the legislature that MGM could have a claim. Some equal-protection and Commerce Clause claims are straightforward: A state, for example, cannot bar an out-out-state company for bidding for state business. But the state is expected to argue that its relationship with the tribes and the question of the third casino is complex, if not unique. Another challenge for MGM will be to convince a court that its rights were violated by the law allowing an East Windsor casino without competition, even though its deal with Massachusetts bars it from doing business in East Windsor or any place else from the state line to the suburbs of New Haven.